Receive help if you're involved in a crash. Keeps a close eye on your vehicle when you're not around. Know how your vehicle is performing and what to do if there is a problem. Connect up to 8 devices. 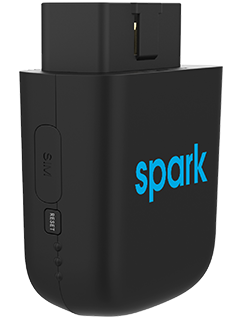 HARMAN Spark: Mobile App req'd: iOS version 9.0 & higher and Android version 6.0 & higher. Data charges may apply to App download/usage. Eligibility: Requires eligible vehicle (compatible w/most 1996 & newer). New or existing AT&T postpaid wireless account req'd. Consumer and Individual/Corporate Responsibility Users only. Telematic Features: Provided by 3rd parties. Must accept terms/conditions in App. Some services may require add'l in-App payment. Location accuracy, availability and timeliness of 3rd party services not guaranteed. Hotspot: Connects up to 8 Wi-Fi capable devices. Geographic restrictions: Coverage & Service not avail. everywhere. Wi-Fi hotspot functionality not avail. outside of U.S., Canada & Mexico. Svc. in Canada & Mexico depends on avail. of unaffiliated carrier coverage. Some telematics features may be limited outside the U.S. or depending on make or model of vehicle. Device restrictions: For in-car use only. Telematics req'd. AT&T reserves right to terminate service if device is plugged into anything other than a vehicle. Video Streaming: Stream Saver not included. General Wireless Service Terms: Subj. to Wireless Customer Agmt at att.com/wca. Svc not for resale. Deposit: Service deposit may apply. Limits: Purchase & line limits apply. Credit approval and other fees, advanced payments and other charges apply. Other Monthly Charges: May include taxes, fed. & state universal svc charges, Reg. Cost Recovery Charge (up to $1.25), gross receipts surcharge, Admin. Fee, & other gov’t assessments which are not gov’t req’d charges. See your plan details and att.com/additionalcharges for details on fees & charges. Roaming: You get an off-net (roaming) usage allowance for each svc. If you exceed the allowance, your svc(s) may be restricted or terminated. International and domestic off-net data may be at 2G speeds. Other restr’s apply & may result in svc termination. AT&T svc is subject to AT&T network management policies, see att.com/broadbandinfo for details. Pricing, promotions & terms subject to change & may be modified or terminated at any time without notice.